Jennifer Shnaekel, principal at Malvern High School, was honored recently as the Educator of the Year at the annual Malvern/Hot Spring County Chamber of Commerce Awards Banquet. 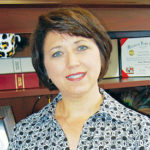 Shnaekel graduated from Henderson State University in 1999 with a bachelor of science degree in education and biology. She has been with the Malvern School District for 18 years, teaching high school biology for 12 years and serving as an administrator for six. Calling herself a “late bloomer,” Shnaekel said she graduated from Malvern High School in 1981 and worked for Arkansas Power & Light for 13 years before she enrolled at Henderson.